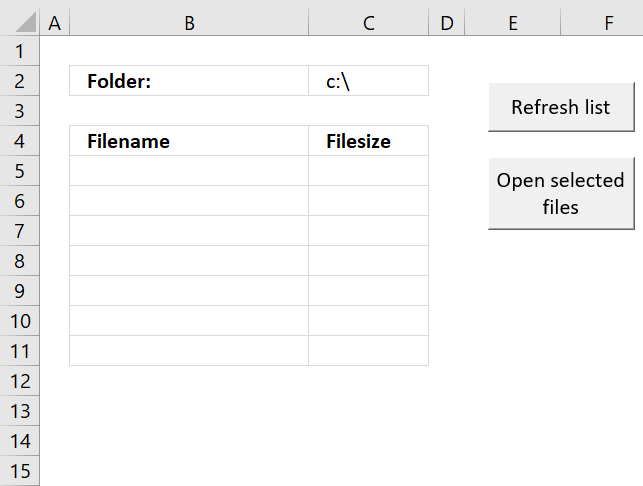 Today I'll show you how to search all Excel workbooks with file extensions xls, xlsx and xlsm in a given folder for a specific string. 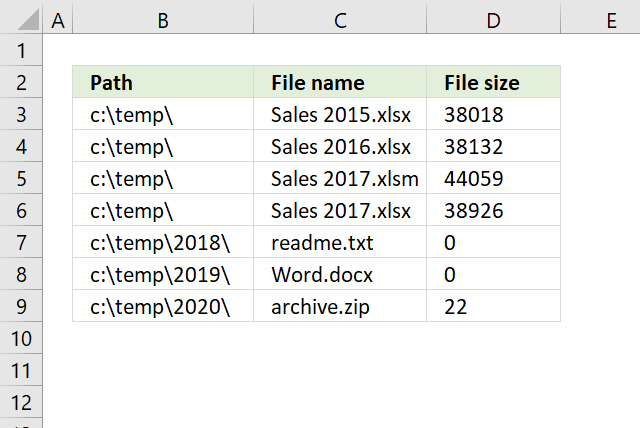 You can search workbooks with other file extensions as well, I will demonstrate what to change in the macro, later in this post. The macro creates a new worksheet containing the search result. 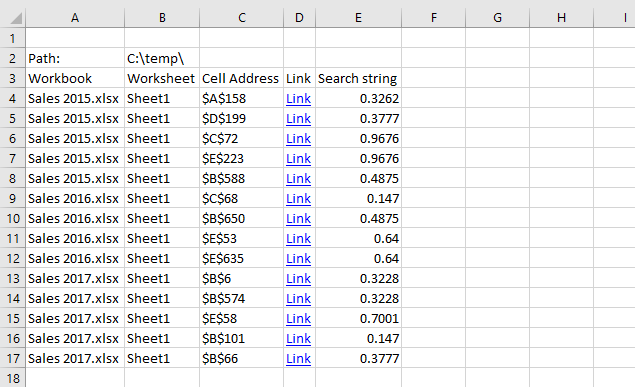 Each result contains a link to a cell where the search string was found. 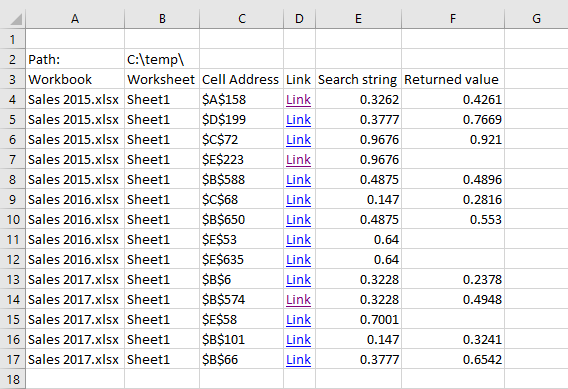 You can then click the link and Excel opens the corresponding workbook and locates the cell containing the search string. There are also macros demonstrated here that allow you to search for multiple values and return a corresponding on the same row. The following macro asks for a folder to search in and the search string. WS.Range("B4").Offset(a, 0).Value = "Password protected"
sht.Name & "!" & c.Address, TextToDisplay:="Link"
The macro loops through all files in the given folder and if the file extension matches xls, xlsx or xlsm the workbook is opened. If the workbook is password protected the macro outputs "Password protected" for that workbook. If it successfully opens a workbook another loop is started that searches each worksheet in the workbook for the given search string. 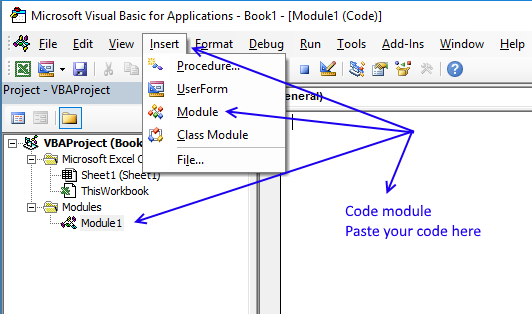 Click "Module" to insert a code module to your workbook. Save your workbook as a macro-enabled workbook (*.xlsm file). If you don't the macro will be gone the next time you open the same workbook. Example, I have 5 workbooks in folder c:\temp\ containing many random numbers. The macro asks for the path and the search string. It then creates this sheet. Click a link and excel loads the corresponding workbook and navigates to the specific cell. Change the following line to whatever file extensions you want to look for. The following macro allows you to search all workbooks in a folder for multiple search strings. 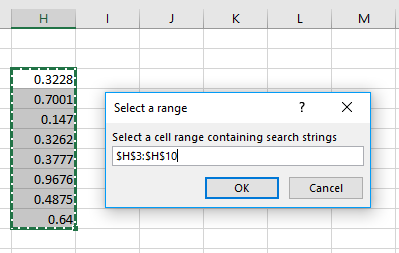 The macro asks for a cell range containing the search strings you want to look for. The next step is which folder to look in? A new sheet is inserted and populated with data if values are found. The macro demonstrated above looks for multiple search strings in all Excel workbooks in a folder and also returns a value on the same row. Select how many cells to the right (positive numbers) or to the left (negative numbers) from the found value. Example, 1 will return the adjacent value to the right. Example, -2 will return the value from a cell two columns to the left of the found value. Select the folder you want to use. The macro will now add a worksheet to your workbook and populate it with data if values are found. Excellent. Excellent job. The BEST of the BEST of the BEST. Is it possible to search a folder of workbooks, based on a cell within those workbooks, and collect a value from a different cell? Yes, I believe it is possible. Send me an example workbook. Tried using this and get a run-time error '91': object variable or With black variable not set. And it's this line of code: "Loop While Not c Is Nothing And c.Address firstAddress"
I made this macro in excel 2010, what is your version? nope, just regular PC. thanks. Your Post has been very helpful, but I'm stuck on something. I've modified your code to fit my needs, but the problem is that my files I am pulling from have 31 pages, and I need the Macro to only pull from the first page. Is there code to do this? All 31 pages have the same "search" words. Instead of pages I mean "worksheets"
Make these changes to my macro. Change Sheet1 to the sheet name you want to use. hi thanks for the great macro really makes a hard job much easier, can this be made to search subfolders as well? Thank you SO much for this code! It is a lifesaver for a monthly process that occasionally results in my having to look for an error in 80+ Excel files! Hi! The file seem to be offline. Cant download it! Any help? Other places where it is hosted? The download works here. I emailed you the file. Sir, This is very helpful topic. Here is one question or I want solution that I have one excel file how has the values in Column B. I Want it search one by one name in the folder worksheets. Can it be possible this. Is there any way to adapt this code to repeat itself and find a list of data rather than just one specific "Str" and return all results on the same worksheet? Bravo. Super macro - thank you for publishing it. Windows Explorer ("WE") with indexing option could not handle contents of my set of Excel workbook files. "WE" search was listing only some files but not all of them. No, the macro can´t do that, as it is. Can you describe in greater detail what you want to do? Hi, is there any way to change it to reference a cell for the path and another for the search string? Subscribed. This code cut my workload for the week by 90%. I can't even begin to express my gratitude for this. I am really happy to hear that, thank you for commenting. Is there a way to adapt this code if all workBOOKS I am searching are password protected and all have the same password? I'd like to assure that the workBOOKS are re-protected by the same password after the search. Many thanks! Change "zzzzzzzzzzzz" to your "password". Nice job, but for me it doesnt work. I set the folder and the search key, it opens all the files but will not return any answer. has matched to my requirement. I appreciate your work and knowledge. I had also posted this in one of the forum but have not received any reply till date. 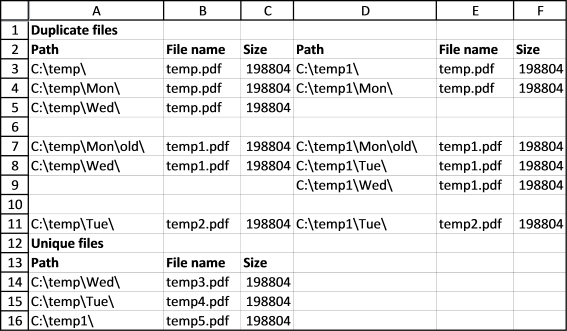 can search in all the files but in only one sheet say Sheet1. As mentioned when I changed the line in your code it gave the error of Next. I will be very thankful if you can help on this issue. sheet2- Cell A1 = any of these numbers. SO, when I run the code it shows that number exists in sheet 1 but doesn't show sheet 2 which is what I am trying to reference the code to. Also, how can I replace the searched quantity to look at a specific cell in the worksheet? hi, your marco is rly great, but is it possible to search more than two single strings at the same time? thanks. would this work for Excel on a Mac? Thanks for creating this code, which makes me hope, it can be the basis of something I'm looking for. I would need to make a search of 5000 different values in multiple workbooks, located in a folder/subfolders. I didn't yet find any similar solution, however, the desired search result is more complex. The point would be to find specific data, located in column A for example, which contains 5000 rows of data. In column B I would like to make the name of containing workbook written for every row of column A. It is also possible, the column A data is not listed in any workbooks, so it should be left empty or any static text, like: "Not found". Does anybody think, creating this code is possible? Very new to computers and I have Excel 2003 and the MS update which does load your xlms file. The result after running your file says no files are in my folder, yet it has a great many xls files. Any way to make this work on Mac? Love the whole idea, just need to use Mac. Thanks. I don´t own a mac, I can´t help you out. Trying to help my daughter - this could be extremely useful in her job; however, it seems to only find results on the first sheet. She must search 20 to 30 Excel files, each with varying number of worksheets. The data she needs to find could be in any one of the worksheets, not just the first one. So far, this macro finds the data on the first sheet, not on any others. Can this be modified to search all the sheets in a workbook before going to the next? This is such a terrific macro and will help save her hours of work if she can use it over multiple sheets within multiple workbooks. Thank you so much for your willingness to share your knowledge and expertise. It does search all the sheets in a workbook. What excel version are you using? I run the macro and it stops after open the first file in the folder and shows "This workbook contains links to other data sources" and then when I click "no update links" the macro stops. Could you help me please? I'm not sure what is causing it? Hey, thanks for the code, is there a way to change it so instead of prompting for the folder you can have it set to a certain location? and also can you have it so it doesn't have to open a new worksheet each time? Correction, Does work for works but only if you get the whole cell right, can this be changed so it shows if any cell has the search word? I want to get the pdf file base on the data in excel and save the pdf file in the other folder. can you help ? This macro is awesome! Thanks so much! I see that this only works if the cell contents match exactly. Can anyone tell me how to modify the code so that it returns a result even the cell contents don't match exactly? For example, I enter search string 123.45a67 and the folder i am searching in has results such as 123:123.45a67. I want this to come up as a result also. Thank you for this incredibly helpful macro! "search.xlsm is already open. reopening will cause any changes you made to be discarded. do you want to reopen search.xlsm"
You probably have saved your workbook in the same folder as you are searching in. but I have another question. It is possible that in column E and F displays values from columns U and V from the workbooks. For example if am searching for a value 1234 and it is found in Book1 Cell A14 that displays also value fm cell U14 and V14? This looks like this will be perfect for what I need. My only question is, instead of searching a local file can the macro search documents stored in a folder that is stored on a SharePoint? If the workbook is allowed to open excel workbooks stored on a sharepoint it should work fine. Very Good code. Is it possible to have a list of all the key search words (search strings) and then run the macro for all the key words at once with the output in single sheet for all. I have like a list of 30 items that I want to search in a dump every hour, so can't really use this macro manually 30 times every hour. I hope you can help. Thanks in advance. Also, it is feasible to search parts of values in a cell instead of the entire value in a cell as currently this macro gives result only if the entire search string is available in a cell. I am looking for a VBA code which searhc excel file name from a folder based on name mentioned in sample file name and email to persons. 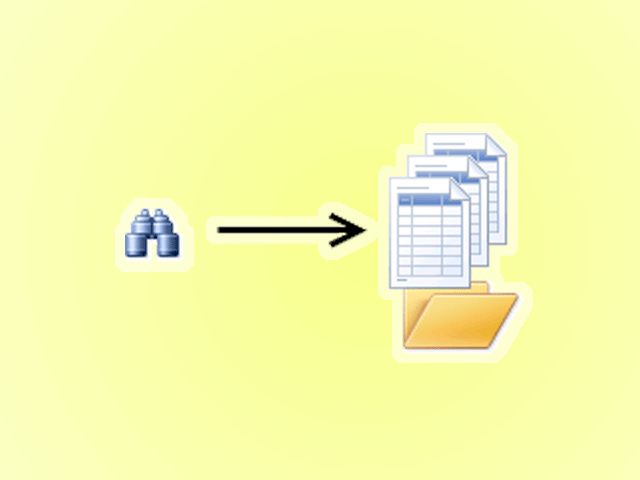 VBA code to search name from cloumn A and same excel name file in a folder and email to mentioned email ID mentioned in B cloumn. Please help to share the VBA code. I am grateful for sharing the macro. It works great. For now VBA is for me unknown world. Is it possible to adapt it for search csv files? This is a very awesome vba. I'm wondering if it's possible to only loop until the first match is found, then move to the next search string? Great bit of VBA code. Thank you VERY much. You generously providing this saved me quite a bit of time and effort. One issue I am having is that the links open the "found" file, but give me a "invalid cell address" message. This may correlate to the Excel version in that it works fine for v. 2010, but there appears to be a hyperlink address issue with v. 2007. As far as I know, there is no different is how these 2 Excel version use hypertext links to other files & cells. Any insight would be welcome. Which vba line is highlighted when the error occurs? The macro fully executes properly and the issue only occurs when the hyperlink to the found cells is used. I did a bit more looking and found that the hyperlink address did not include single quotes around the sheet name. It appears that if the sheet name contains spaces Excel need single quotes around the sheet name. Again, thank you VERY much for your excellent work and assistance. You are right, there seems to be a problem with worksheet names containing one or more space characters.
"'" & sht.Name & "'!" & c.Address, TextToDisplay:="Link"
hi, I installed your code today, and it was running, but then i realized the Excel files i need are in binary format . . xlsb. I changed the macro to look for xlsb but not it runs, but stalls (and does nothing) after creating a target worksheet. Can you provide the vba line you changed?